Even before the iPad came out and took the world by storm, there was a loving husband in New Zealand creating his own version of a touch-screen computer for his wife. This awesome DIY project was meant to be a built-in kitchen computer for keeping track of recipes, shopping lists and kitchen inventory. 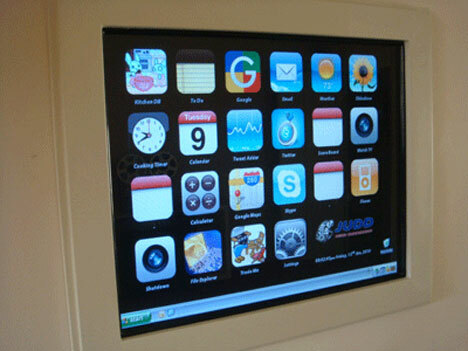 It was based on the design of an iPhone and, although the iPad was still a few months in the future, it very strongly resembles Apple’s own version of a touch-screen computer. Besides building the actual computer himself, Ryan cut out a hole in his kitchen wall to permanently mount the screen. Unlike the iPad, the actual computer is not contained behind the touch screen: wires run inside the walls to connect the hidden tower to the screen. 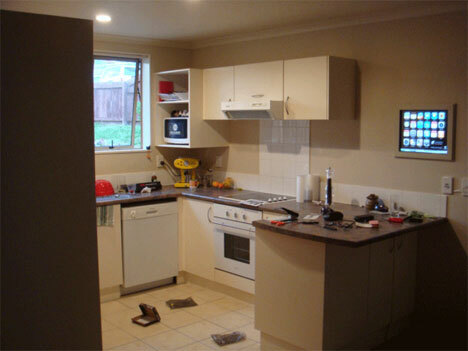 When the system isn’t in use, it looks like a digital photo frame permanently mounted in the kitchen wall. It has a barcode scanner to keep track of kitchen supplies and even works as a weather station as well as performing all kinds of other computer functions. Ryan designed a custom interface for the system which he calls “iKitchen” and which he now offers for free to others who want to emulate his awesome invention. According to Ryan, the entire project cost $1893 in New Zealand dollars (around $1400 American), which is still quite a bit more than an iPad, but we’re guessing the satisfaction that comes from building a gadget like this more than evens out the extra expenditure. See more in Computers or under Gadgets. December, 2010.